My border collie, Babies loves to pose for pictures. 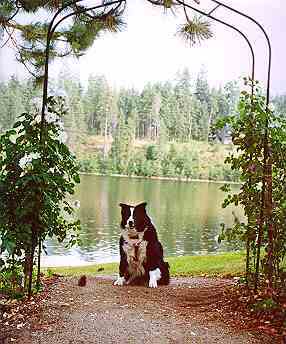 So here she is showing off my Lace Cascade climbing roses on the rose arch with the lake in the background. Directly to the right of the arch are some sun loving plants including this "cottage garden" plant, Lychnis Coronaria. 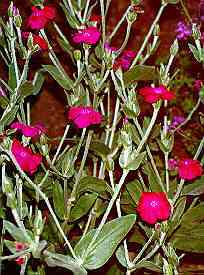 The leaves are a gray green and the flowers a very bright magenta. Below the rose arch are more shade beds and some interesting grasses. Cross the beach and visit the White Garden NEXT.